Age-related slowing of reaction times (RTs) is well documented but whether the phenomenon reflects deficits in movement preparation and/or response generation processes is unclear. 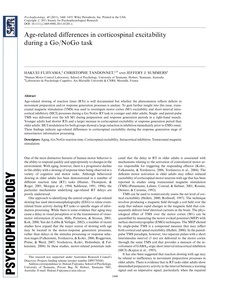 To gain further insight into this issue, transcranial magnetic stimulation (TMS) was used to investigate motor cortex (M1) excitability and short-interval intracortical inhibitory (SICI) processes during a Go/NoGo RTtask in younger and older adults. Single- and paired-pulse TMS was delivered over the left M1 during preparation and response generation periods in a right-hand muscle. Younger adults had shorter RTs and a larger increase in corticospinal excitability at response generation period than older adults. SICI modulation for both groups showed a large reduction in inhibition immediately prior to EMGonset. These findings indicate age-related differences in corticospinal excitability during the response generation stage of sensorimotor information processing.